Prom night… It’s the night many of us girls can remember every detail, no matter how many years have gone by: the hair, the makeup, the flowers, all the dancing, the date and, most importantly, the DRESS! Prom is the highlight of many girls’ entire school year and picking out the perfect dress is the most important part. It’s so much fun to peruse the racks, sorting through gown after gown covered in sequins, beads and other beautiful embellishments in every color ever imaginable. The choices are seemingly endless and like every girl will tell you, you just know when you find the perfect one. Sadly though, some girls are not able to have this magical experience due to financial reasons and other factors. Being a teenager is hard enough without having this to worry about too so I wanted to help! I found an organization in Charlotte called the Girl Talk Foundation. Every year, they put on an event called Prom Project. This year, it will be taking place at ImaginOn in Uptown Charlotte on Saturday, April 12. At this event, girls get to choose a prom dress, shoes and accessories from a make-shift boutique free of charge. Before they are able to shop, the girls attend an etiquette class that includes beauty, fashion and prom safety tips. (I love that!) Girl Talk’s mission is “to empower every girl to find her voice to become the success she is destined to be — confident, smart, proud and powerful.” Their programs focus on a variety of things such as teaching young women leadership skills, positive self esteem, planning for college and/or a career and a host of other practical programs to help empower young girls. I believe so much in what Girl Talk Foundation does and knew that I had to partner with them. I went through my closet and found some gently used dresses last year to donate and asked others on Twitter, Facebook and Instagram to do the same. 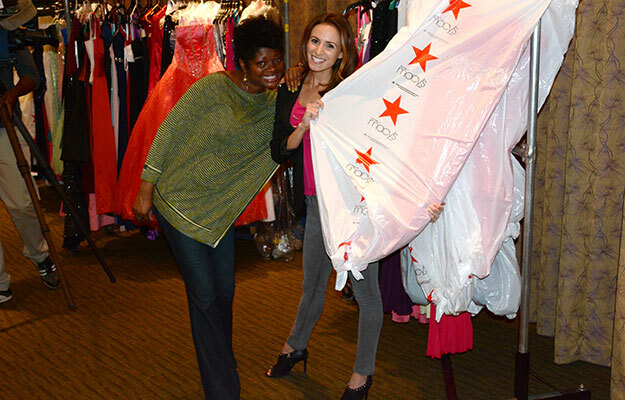 The response was overwhelming and we had almost 100 dresses donated last year. The Kyle Busch Foundation then matched the number of dresses donated with brand new dresses for these wonderful young ladies to choose from at Prom Project. 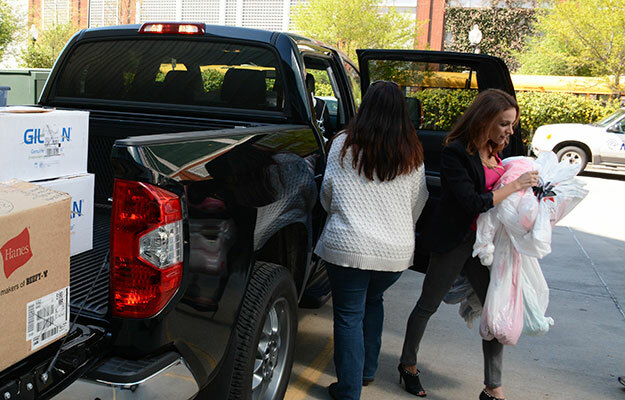 This year, we have had over 100 dresses donated and so my Mom and I, along with others from Kyle Busch Motorsports, headed down to Macy’s at Northlake Mall and started to shop! Truly this was a dream for me! Getting to pick out dresses in every style, shape and size was a blast! I also interrogated some young girls who were shopping to make sure I was keeping up with the trends for prom season and buying all the hot dresses! It is my hope that these young women, through the Girl Talk Foundation’s Prom Project event, will love these dresses and have the most wonderful prom night! I just want to thank you all from the bottom of my heart for making our efforts to help Girl Talk’s Prom Project a success. You are all a true blessing and because of you, these girls’ will be able to have the night of their dreams!